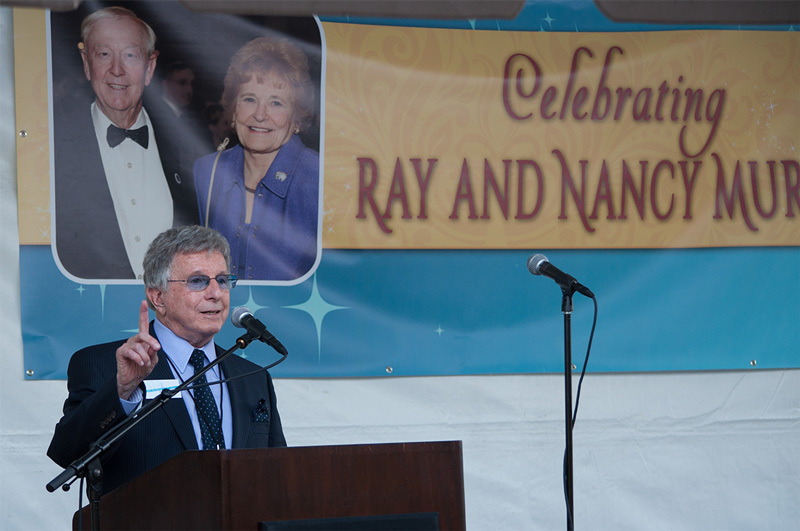 The grand re-opening of the all-new Murray Theatre at the Marcia P. Hoffman School of the Arts at Ruth Eckerd Hall took place March 23, 2015. The entertainment-filled ribbon cutting ceremony was open to the public to partake in the festivities, which included a performance by the Ruth Eckerd Hall / Clearwater Jazz Holiday Combo and a performance by former Marcia P. Hoffman School of the Arts scholarship recipient Quentin Darrington, who has starred in Broadway productions of Ragtime and Memphis. The legendary rock ‘n’ roll group Sha Na Na also made a special appearance. During this elegant ceremony, Zev Buffman, President and CEO of Ruth Eckerd Hall, Inc., announced the opening season of the Murray Theatre, which included 13 new productions and 36 performances set for the spring of 2015. Presentations will include live concert performances by local, national and international acts Emily Kopp, Brad Noblitt, Vonda Shepard, Henry Gross and John McEuen. A series of visiting productions from many regional West Florida Theatrical companies will also be presented including Sarasota’s Florida Studio Theatre Improv, Stageworks Theatre’s Ain’t Misbehavin’ and Tampa Rep’s The Apocrypha of Theodore Roosevelt. Hat Trick Theatre, the Murray Theatre’s official in-house theater company will present The Complete Works of William Shakespeare (an abridged comedy). A brand new mystery, To Quiet The Quiet, the first in “discovering new theatre” will make its premiere as part of a series of new works launched in the new Murray Theatre. Additionally, a new foreign and classic film club featuring some of the most well-respected movies will bring together movie fans in an exciting way to view and discuss films. The series kicks off with the screening of the film Moulin Rouge. A champagne evening celebrating a century of glamour and grace comes to the all-new Murray Theatre with the premiere of The Loretta Young Legacy Project. The evening includes memories told by her family; Ms. Young’s memorabilia will be on display including her Academy Award®. Originally opened in 2003 as part of an education expansion of the Marcia P. Hoffman School of the Arts, the Murray Theatre has completed a $1.5 million reconstruction, which includes a 2.5 story-high entrance and drop-off canopy with a LED lighting system, an exterior-accessible Ticket Office, enlarged lobby space featuring interior finishes, new concessions, all-new seats, updated flooring and several new seating configurations, including cabaret configuration with food and beverage, theatre in the round, thrust stage and Shakespearean horseshoe seating. With the state-of-the-art additions, the students from the Marcia P. Hoffman School of the Arts Careers in Theater program will have the opportunity to be involved in creating sound, lights, sets and audiovisual design and execution in the many productions. The all-new Murray has new capabilities of recording student and other performances for teaching purposes.